Ammo, samurai swords, mental health books, journals and a news clipping about a past school shooting were recovered at Adam Lanza's Newtown, Conn. home. Prosecutors say he fired 155 shots in less than five minutes. Newtown killer Adam Lanza and his mother kept their home stocked with a massive cache of guns, knives, swords and ammunition — a startling array of weapons described in newly released documents that sketch a portrait of a household enamored with firearms and of a young man apparently coping with emotional issues. The documents, released Thursday morning, outline what police found in the home following Lanza's Dec. 14 rampage, which began with him shooting his mother in bed and culminated with a massacre inside Sandy Hook Elementary School, where he gunned down 20 first graders and six adults and then killed himself. The school attack is believed to have lasted less than five minutes. They also raise new questions about what Lanza's 52-year-old mother, Nancy, knew about the danger that her son posed, and whether she was complicit in allowing him to obtain guns. Among the paperwork taken from the home they shared were photographs of what appeared to be a bloody body, a New York Times article about a 2008 mass shooting at Northern Illinois University, self-help books for understanding the minds of people with Asperger's Syndrome and autism, a paperback entitled "Train Your Brain to Get Happy," a guide to pistol shooting and a holiday card containing a check Nancy Lanza wrote to Adam for the purchase of a firearm. A witness told FBI agents that Adam Lanza "rarely leaves his home" and was considered a "shut-in" and avid video game player, the documents say. The witness, whose identity was blacked out of the text, also told agents that Adam Lanza had attended Sandy Hook and that the school was his "life." The documents also show that Adam Lanza kept a gun safe and a military-style uniform in his bedroom, and that he and his mother some sort of certificates from the National Rifle Association. Thousands Participate in Sandy Hook Benefit Run in Conn. The NRA said in a statement to NBC News Thursday there "is no record of a member relationship between Newtown killer Adam Lanza, nor between Nancy Lanza, A. Lanza or N. Lanza with the National Rifle Association. Reporting to the contrary is reckless, false and defamatory." 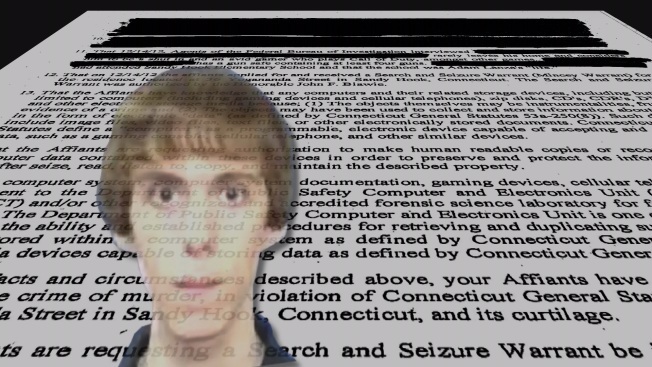 Police seized several of Adam Lanza's personal journals and drawings, a smashed hard drive, handwritten notes on the addresses of local gun shops and several printed emails. The documents do not indicate what they contained. The list of weapons found in the home reads like the contents of a survivalist bunker. The guns included an Enfield Albion bolt-action rifle, a Savage Mark II .22-caliber rifle, a black BB gun and a starter pistol. In addition, investigators found several large-capacity magazines, along with a huge array of ammunition: at least 126 shotgun shells and 1,526 bullets, including 661 .22-caliber bullets, 178 .45-caliber bullets and 161 9mm bullets. There were also nine knives, three Samurai swords, a pole outfitted with a spear and blade and a bayonet. Many of those items were found in an open gun safe, but the documents do not indicate whether they were found in the safe in Adam Lanza's bedroom, or if there was a second one elsewhere in the house. In any case, Adam Lanza clearly had a wide array of weapons to choose from to carry out the second deadliest school shooting in U.S. history. He started with his mother, shooting her in the forehead with a .22 caliber rifle. Then he took four guns to the scene: a .223 caliber Bushmaster rifle, which he used to shoot the students and school workers; a Glock 10mm handgun, which he used on himself; a loaded 9 mm Sig-Sauer handgun found on his body; and a 12-gauge Izhmash Canta shotgun, which he left behind in his mother's Honda Civic outside the school. In the car there were two magazines containing 70 shotgun rounds. All four of those guns were legally owned by Nancy Lanza, authorities have said. State Police Lt. J. Paul Vance told reporters Saturday that investigators have uncovered "very good evidence" at the two crime scenes "as to how, and more importantly why, this occurred." The documents, which had been under court seal since the start of the investigation, cover five search warrants. The seal expired on Thursday. The judge overseeing the case granted prosecutors' request to redact certain details, including a witness’ name, a telephone number and a credit card number. Along with the search warrant documents, Danbury State's Attorney Stephen J. Sedensky III included a statement that added details to the rampage and its aftermath. He stressed that the investigation has not ended, adding that he had determined that the release of the search warrant documents would not jeopardize the case. He also acknowledged that state lawmakers have been anxious to learn more of the attack to help them negotiate a wide-ranging gun control proposal. The state Attorney General may release more information later this week. A final report on the investigation is expected in June. "Our sympathies for this tragedy continues to go out to the victims' families, friends and the Newtown community," Sedensky said. The first 911 call from the school reached authorities at 9:35 a.m., the documents say. When police arrived, they found Nancy Lanza's Civic parked in the fire lane in front of the school. Adam Lanza had shot his way into the entrance. The dead were found in two classrooms near the front door. In one of the classrooms police found Adam Lanza's body, outfitted in military-style clothing. They recovered the Bushmaster—with 14 rounds in its magazine and one in its chamber—and two handguns, along with three fully loaded 30-round additional magazines for the Bushmaster. Nearby were six more 30-round magazines, three of which were spent, and three of which still had bullets inside. At the scene investigators collected 154 spent .223 shell casings. Authorities headed to the Lanza home, about five miles away, and found Nancy Lanza in bed in a second-story bedroom with a gunshot wound to her forehead, and a rifle on the floor. Besides the article about the Northern Illinois University shooting, in which Steven Kazmierczak killed five people and injured 21, the newly released Newtown documents do not add to prior reports that Adam Lanza had studied prior mass shootings. The Hartford Courant has reported that investigators found news articles about Anders Behring Breivik, a Norwegian man who in July 2011 detonated bombs that killed eight people in downtown Oslo before going on a rampage at a summer retreat, shooting 69 people to death, most of them teenagers. Connecticut Police Lt. Paul Vance has in the past dismissed reports that Lanza had felt himself in competition with other mass murderers as "mere speculation." State police and local officials privately briefed victims' families at the Newtown Municipal Center Wednesday night on how to handle the release of the documents. "I think it reopens...it causes them to revisit the pain they felt three months ago," said Newtown Schools Superintendent Janet Robinson. "It's really too bad when we go on this path of healing to have these things that come back to us and remind us and take us back to the events again. It's hard."